The strong rapid tournament played in Beersheba saw two players sharing first place. First seeded Evgeny Alekseev and the experienced Israeli GM Alexander Huzman tied on the top of the standings with 7/11 points. In the last round, Huzman caught the leader with a fine victory over Maxim Rodshtein. Alekseev confirmed his status as favorite and dominated the standings until the eighth round. Czech GM Viktor Laznicka defeated him in the ninth round and allowed some players to close on the Russian. 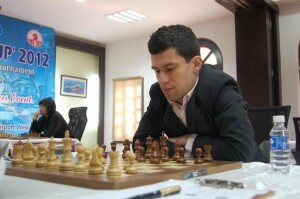 Two draws in the final rounds were enough for Alekseev to share first place. GM Michael Roiz finished third on 6.5/11 points. The Beer Sheba chess club was founded by Eliahu Levant, a reputed trainer and arbiter, right after his immigration from Leningrad to Israel in 1973. Within just a couple of years the club and its chess school turned under Levant’s most energetic leadership to be the most dominant factor in the Israeli chess scene and by now it can boast more than 20 national team championships, numerous youth and adults national titles and an impressive list of International events hosted by the city over the years with the participation of world-class players highlighted by the finals of the world team championship in 2005. The city arguably holds a world record of number of Grandmasters per capita (1:20,000).